After the first 52 years of existence of the Eloise Butler Wild Flower Garden, Ken Avery would be only the third person to be its daily guardian and protector. The first Curator was Eloise Butler herself, who served from 1911 until her death in April 1933. 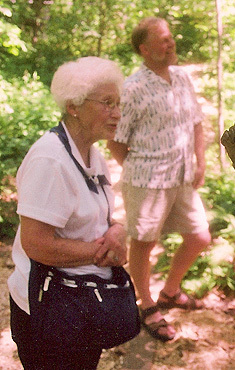 Succeeding her was Martha Crone, who had been Eloise’s occasional helper and plant finder and then served as Curator until her retirement in 1959. That year, a young man of 33 named Kenneth E. Avery began what would be the longest tenure as Curator/gardener of the Garden. 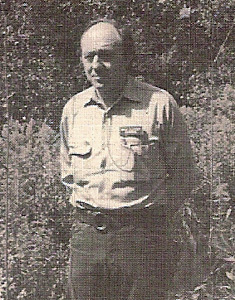 Five years earlier (in 1954), Ken moved to Minnesota and joined the Minneapolis Park Board staff as an assistant to Martha Crone. In the spring of 1959, he became Curator, a position he would hold until his retirement 28 years later, although the title "curator" would, by 1965, be replaced with the title "gardener", which more conveniently fit into the Minneapolis Park Board hierarchy at the time. 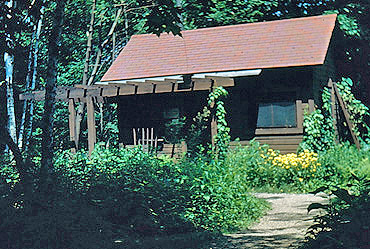 Below: Ken Avery was the only Garden Curator who had the experience of using both the old "Office" and the Martha Crone Shelter which was completed in 1970. The old office was constructed in 1915 by Park Board carpenters after a design of Eloise Butler. Old office photo from a Kodachrome by Martha Crone, dated June 24, 1948. As the new man in charge of the Garden in 1959, Ken Avery was highlighted in the Minneapolis Star newspaper's column "Town Toppers." (Column). 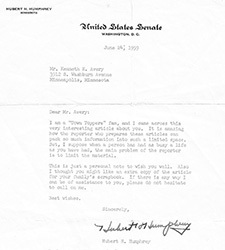 A frequent reader of that column was then U. S. Senator from Minnesota Hubert Humphrey and Senator Humphrey sent Ken a letter in reference to the column (letter). Ken also carried binoculars so he could observe birds “because they’re here.” He said, “I may hear a song and stop what I’m doing and try to identify the bird.” At first Ken was not entirely familiar with Minnesota birds as he was not a native of the state. He wrote in his annual report to the Park Commissioners for 1961 (Ref. 19) that “These birds are just as important to the Garden as are the flowers since at least as much interest is shown in them as in the flowers.” He further noted in his annual report that “In light of this, I have enrolled in a course in Minnesota Birds at the University of Minnesota to increase my competence in this field.” In addition, the Minneapolis Woman's Club had awarded him a 2-week fellowship to the Audubon Camp in 1960, running August 8 to the 22nd. 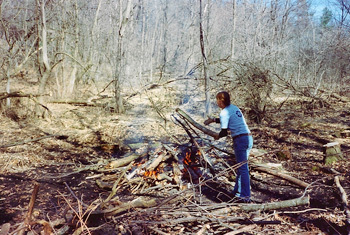 Ken was the first to use the restorative process of burning the prairie areas in the early spring before plant growth began, in order to remove thatch and unwanted woody species. 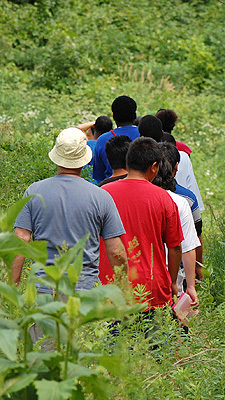 He was the first to use a wood chip mulch on the trails to prevent erosion and improve walking conditions. Ken Avery was a long-time member of The Friends of Wild Flower Garden, joining in 1961, contributing to The Fringed Gentian™, serving on the Board of Directors and serving as President 1966 - 1968. Ken's philosophy of maintaining the Garden was best expressed in this statement: "In regular gardens it is desirable that it appears that man has been there and done his work. In our Wildflower Garden the ideal is that it appears that the present viewer is the first person to see the area." (Oct. 12, 1976, letter of Ken Avery to Gordon Morrison, Coordinator of Environmental Ed at Minneapolis Park and Recreation Board). 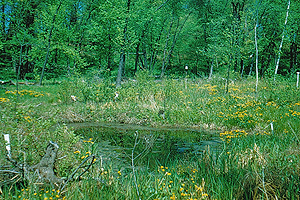 Above: Pool #3 in the wetland on May 27, 1950, two years after the original excavation. Photo from a Kodachrome by Martha Crone. Click on image for a larger photo. As a result of the dryness that could seriously affect the wetland area in certain years, particularly the 1930s, former Curator Martha Crone had three new open pools dug out in 1947 to store water and support aquatic plants. That made four pools in total within what is considered the space of the Garden today, the fourth being the small original pool that was created by Eloise Butler right after the Garden was set aside as a native plant reserve. The larger Mallard Pool (PDF) that was located in the North Meadow had been abandoned by this time. "The next day a girl from the Animal Rescue League came over with six little squirrels to release in our Sanctuary but I convinced her that they were still too small to be left there on their own. Before she could leave, “the squirrel" crawled in with the six little squirrels and stole half of their food. 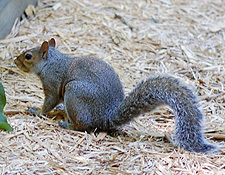 Well, five weeks later it is still here,-- the tamest squirrel I have ever seen in my life! I (and you) can actually pick her up- something that is usually even difficult to do to a squirrel that is being kept as a pet in someone's home." “Last spring when one of my assistants was golfing he visited the Chalet at Wirth Golf Course and while he was there one of the attendants remembered that some mail addressed to the Garden had been delivered there at the Chalet. He looked through the desk and found what he hoped was all of it. Some of it had been delivered a couple of months earlier and required answers. Then about a month ago my assistant again visited the Chalet and again they remembered that they had some mail for us. One of the letters was mailed last spring requesting information on the possibility of a conducted tour of the Garden last June. Needless to say the only answer I could send now was one of apology." (20) He went on to conclude that future incidents would only lead to a very poor public image. The Garden never did get a mail box to this day. 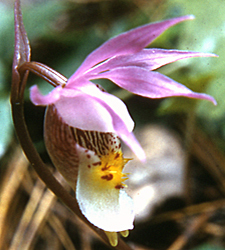 Above: Fairy Slipper Orchid (Calypso Bulbosa), Photo taken by Martha Crone in the Garden on June 1, 1954. Also being tried once again was Trailing Arbutus (Epigaea repens - photo above), which Martha Crone tried to introduce many times, first in 1933. The last plants had been eliminated some years ago by mice. Also in the category of exotic introductions and re-introductions was Fairy Slipper Orchid (Calypso Bulbosa photo at left), Adam & Eve orchid (Puttyroot) (Aplectrum hyemale) - photo below right) and Cranefly orchid. (Tipularia unifolia). 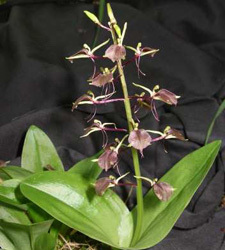 Fairy Slipper Orchid was brought in by Martha Crone in 1935 and ‘36. Adam & Eve was introduced by Eloise Butler each year between 1907 and 1910. Martha Crone brought it in during 1933, ‘35 & ‘36. By 1980 Ken would state in later years that this experimentation was no longer the Garden’s mission (see "Reflection" section below). More details of Eloise Butler's and Martha Crone's plantings are found in the Garden History archive for each of those years. Mosquitoes were always a problem in the Garden. Imagine what circumstances Eloise Butler worked in. Martha Crone had similar problems. Back in 1933, Theodore Wirth had paid a visit to the Garden on the occasion of the Last Rites Ceremony for Eloise Butler and evidently had written a comment to Martha about the Mosquitoes. She replied “I wish to offer my apologies for the ill manners of my mosquitoes, they are rather difficult to train as each one lives only a short time.” (Ref. 24) The Friends provided certain funds to obtain items she needed in the Garden, such as the mosquito sprayer, but until Ken Avery got the mist blower we don’t know how effective the hand sprayer was. In Ken’s day DDT was available and was the insecticide of choice at the time. In 1965 he reported that 2,000 people in 95 organized groups visited for conducted tours. (23) The number of tours is significant as it would only increase in the next decade. Martha Crone’s activities, while still Curator, had set the stage for people wanting to visit the Garden. She was an endless promoter of the Garden. In 1950 she introduced the first free Garden Brochures; in 1951 she produced a Garden History and in 1952 she introduced her Self-Conducted Tour brochure. She references the success of these in several reports (10,000 distributed in 1952) and in 1953 there was also available a Garden plant list, which included the 1951 history, which were sold for 10 cents each to visitors. She did radio and newspaper interviews. Also in 1948, Martha began to put together a set of color slides of Garden plants that she could use for illustrated lectures about the Garden. She began to give talks in 1951. In 1952 and 1953 alone she give 53 lectures about the Garden to a total of 3,118 people. She would occasionally write of the burden on the Curator of handling all the groups that wanted tours. These years were the heyday of Garden visitations, however in Ken's first years as Gardener he sometimes felt lonely in the Garden. He would later tell Jo Ann Rice "I'd hear the gate clank open and would practically run out to shake the visitor's hand." (Golden Valley Sun June 7, 1972). That was obviously not during the later times of heavy tours. In 1965 Ken began the practice of burning off dead plant material from the prairie area. Previously he would cut it. Friends member Phoebe Waugh remembers visiting the Garden in the early 1960s with her young daughter and talking to Ken and she remembers a "hot" prairie with the mowed grass. Burning would also prevent the growth and encroachment of trees and shrubs where they were not wanted. It also ushered in the more natural arrangement of native plants. Phoebe's life took her away from the Garden until 1996 and she was amazed at the changes that had occurred in the Prairie Garden once mowing ceased. This practice of burning has continued to the present day, although not with the frequency of earlier times. 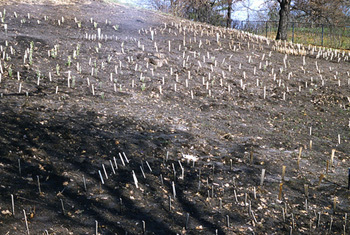 (23) Photo at right: A spring prairie burn in progress. The use of fire near the wetland area presented its own problems as there is an underlying layer of peat. It was a practice of burning the larger accumulations of wood removed during the winter. In the 1970s dead elm wood was the main debris removed. Ken and his helpers had to be very careful where they burned it - he had put out many peat fires in the past. In November of 1976 someone had started a fire in the Garden and the peat caught fire. Ken had to call in five extra men to help dig it out. (10) This is still a concern today. Cary George was burning brush piles in November 1989 at the edge of the wetland and started a peat fire which took some effort to put out. (17b). Photo: Current Garden Curator Susan Wilkins burning Buckthorn cuttings in the spring in the wetland area. 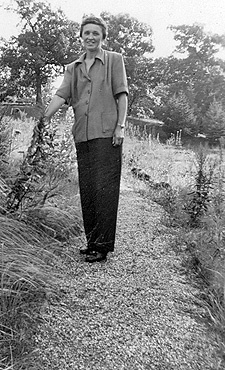 Above: Martha Crone in the Upland Garden, 1951. Note the pea gravel path. Photo courtesy Minnesota Historical Society, Martha Crone Collection. Above: Moccasin Flower (Cypripedium acaule). Photo ©G D Bebeau. While a certain number of orchids are native to the Garden site, only two exist in the Garden today: The Showy Lady’s-slipper (Cypripedium reginae) and the Yellow Lady’s-slipper (Cypripedium parviflorum var. pubescens). Martha Crone was particularly partial to orchids. 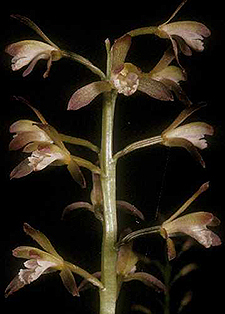 Her 1951 census lists 25 in the orchis family as present in the Garden. Many would die out - frequently due to the difficulty in transplanting these species. Ken liked them also and would attempt to reestablish certain of the species. 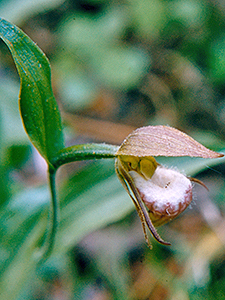 Mentioned above in the section on plant experimentation were Fairy Slipper Orchid (Calypso Bulbosa), Adam & Eve orchid (Puttyroot) (Aplectrum hyemale) and Cranefly orchid. (Tipularia unifolia). 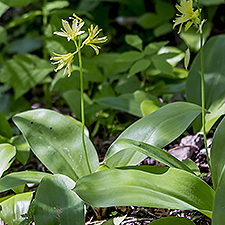 Above: Large Twayblade (Liparis liliifolia) Photo ©Merel R. Black, Wisconsin Flora. 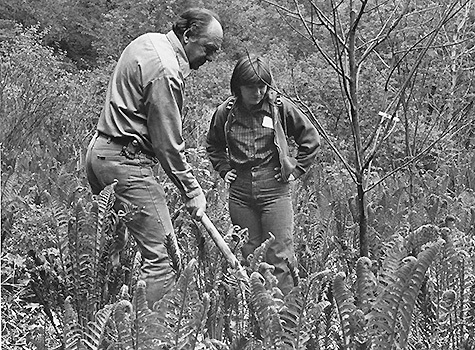 To winter-protect the fragile young ferns Ken had the area heavily covered with oak leaves in the fall of 1963. The leaves would serve as mulch in the coming years. Moth crystals were spread to discourage the mice. Today, the area has filled in with other plants and larger trees but still has a number of ferns. Photo above: The Fern Garden, in the process of being planted, May 14, 1956. Photo from a Kodachrome by Martha Crone. 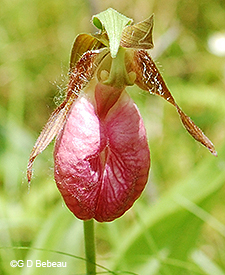 Above: Ramshead Lady-slipper (Cypripedium arietinum). 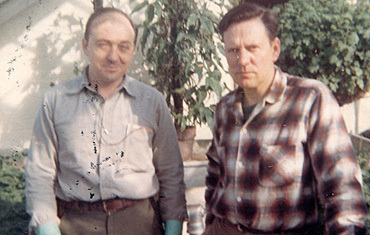 Photo taken in the Garden by Martha Crone on June 9, 1954. 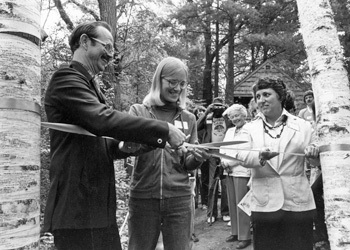 While Ken’s philosophy was that the wild areas should be kept wild, the use of Wirth Park for recreational skiing and later for competitive skiing was not going to go away. When it occurs in the buffer zone around the Garden it has been a contentious issue for the Friends and the Park Board ever since. The progress of the disease was to last for many years. 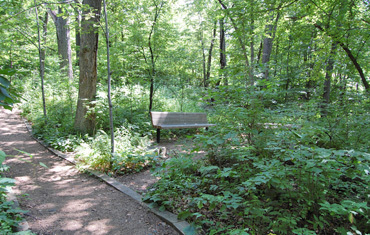 In 1975 Ken noted that the Park Board was removing diseased elms from the swamp area behind the Garden and that three trees had been removed within the Garden in 1974. (7) In 1976 half of the remaining elms in the Garden died during the summer. 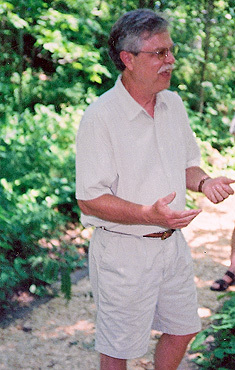 Friends president Alexander Dean also noted that the loss of tree canopy in the Woodland Garden, causing the growth of brush, vines and heavy weeds, would require re-planting of trees. (9b) Beginning in the fall of 1977, small trees were being planted to replace elm losses (photo below). (11) This process continued for years during his tenure as Gardener. The scourge began in 1963 and By 1986 94,988 trees had been removed with 105,012 remaining - all within the City of Minneapolis. Most of those in the Garden were lost by that time although there would be further removals of elm into the 1990s. 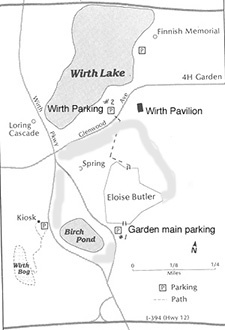 The 1964 expanded area of control for the Garden is outlined in gray. In 1964 the Park Board agreed that the area surrounding the Garden (outside the fence) was to be placed under his control, with a corresponding increase in workload. Ken was in favor of this change. In fact he considered it an important milestone "one rivaling, if not exceeding, in importance that of the addition of the Prairie Garden in 1944." He added - "This quadrupled the area we have to work with and makes it possible to treat the entire area as one integrated unit. We of the Wild Flower Garden are eager to assume this task.....we have always felt that the chief value of this area was for the study and appreciation of nature. Now that the Board has passed the motion dedicating it to this end, we are planning to adjust all maintenance activities toward this goal. It will not require any great change but just that all activities be paced to show greater respect for the ecological relationship of the area and to exploit all of its possibilities as a natural area." (23) Unfortunately, the realities of the budget and other management issues prevented this idea from being carried out. The result of that is that the buffer zone area and the uses made of it would be a source of future contention for those that followed in Ken's footsteps. During his tenure, Ken Avery experienced a number of changes in the Garden - some of his own doing of course. He changed the philosophy of what plants should exist in the Garden. He was more focused than Martha Crone on plants that were native to the area - not just to the wider geographic climatic zone. In 1980 he reflected on several major Garden issues. One issue was in his relationship with the Minneapolis Park and Recreation Board. Martha Crone had the title of Curator, his title is Gardener but the pay and duties were the same. This was somewhat difficult for him as for the first six years he had had the title of Curator. A second issue was his observation that the Garden reflected the personality of the person in charge. Editorial Notes: Ken's statements about institutionalizing the Garden can be explained in another way. Both Eloise Butler and Martha Crone had freedom to shape the Garden in the manner they chose. The landscape design and the plant selection was their prerogative - limited by their budget and time. They made an annual report to the Park Board of what they had accomplished and that was that. The result of that was a Garden that reflected, in Ken's words, "the personality of the curator." It is fortunate that Eloise Butler had that free opportunity or the Wildflower Garden as we know it might not exist today. But once the focus and plan was in place, the goals and vision of the creator should not be constantly modified by the new person in charge. "Institutionalized" meant keeping to the plan unless there was consensus to change. It meant adhering to a plant selection criteria that was based on a well founded ideal. Ken narrowed that focus down to a Wildflower garden that appeared not to reflect the hand of man, but of a more natural order, and stocked with plants that were native to the area. If the Park Board could oversee that focus, then the ideal of the Garden could be preserved. 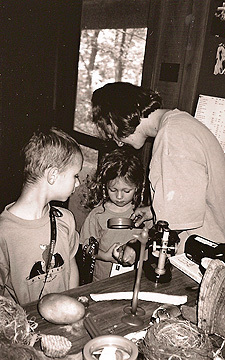 The organization of the Friends of the Wild Flower Garden was founded to preserve and protect that ideal. All those who knew Ken appreciated his abilities and his dedication to the Garden. It was difficult for him to let go as he wanted to find someone who would carry on his philosophy, although at the same time as noted above, he thought the Garden should not reflect the personality of the person in charge. When Cary George got the job Ken felt that Cary George would “belong there”. 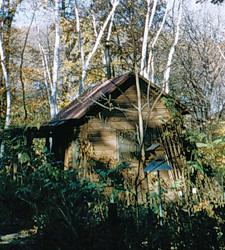 Above: The "old office cabin" where the Friends held their first meetings in the Garden as it looked on October 21, 1955. Photo from a Kodachrome by Martha Crone. 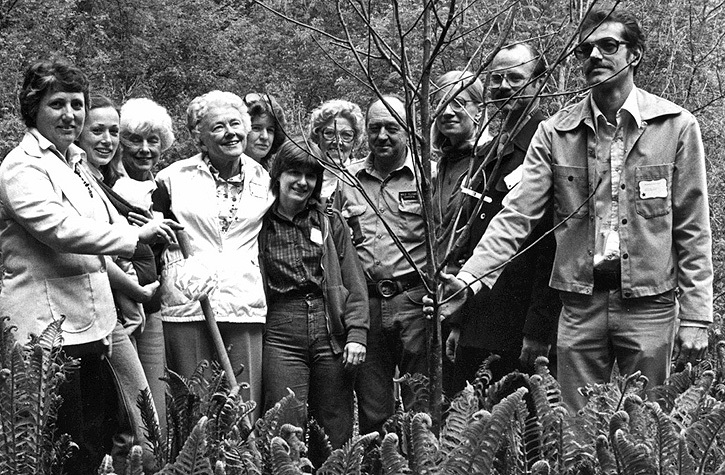 On May 21st, 1966, at the annual meeting, Ken Avery was elected president of The Friends of the Wild Flower Garden. It was the first time the annual meeting was held at the Garden and it was on a day of “profuse bloom” as reported. 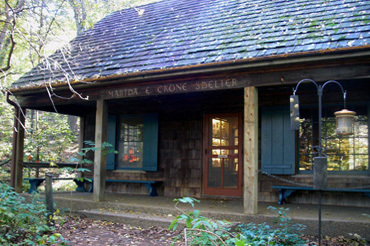 This was before the construction of the Martha Crone Shelter so the meeting would have been in or near the old “Garden Office”. Martha Crone was still the editor of the Friends’ Newsletter The Fringed Gentian™. This was still the era when experimentation of which plants would grow in the Garden environment was taking place as noted above in the section on plants. (26). Ken was reelected President at the 1967 annual meeting, held again in the Garden on May 20th. Mrs. Clinton Odell (Amy) had passed away on Dec. 7, 1966 and a memorial for her was being planned. 1967 was the first time the Friends began to publish memorials given for the Garden. In the summer Ken was host on a Garden visit of London actors Dame Sybil Thorndike and Lewis Casson who came to the Garden, brought by their daughter Mrs. Douglas Campbell of the Guthrie Theater. A devastating tornado uprooted over 2000 trees in Minneapolis, but the Garden was spared. (26). At the annual meeting of The Friends on May 18, 1968, the president position was passed on to Cay Faragher. 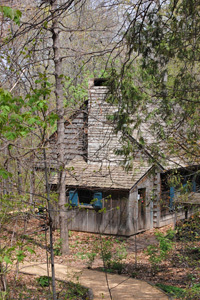 The day was very cold and uncomfortable for the group as they met in the “little cabin”. But the idea of building a new visitors center was begun at this meeting and Cay Faragher would see it through to the completion. 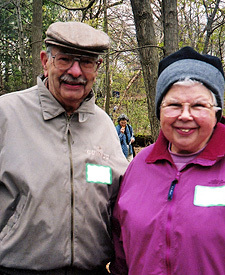 Ken remained an active member of the Friends throughout his tenure. 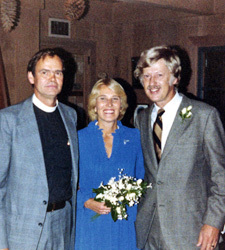 As late as 1985 he chaired the nominating committee for board and officer positions. He also generated some Garden publicity via an interview on station KSJN in April, 1985. (26). “Thank you again for the beautiful day I spent in the Wild Flower Garden. Please let the kind people who had volunteered to keep shop know how much I appreciate their interest and the warm welcome they extended not only to me but to all the individuals and groups who dropped by that day. A memorial: In January of 1998 The Friends board decided to pursue doing something to honor Ken Avery. 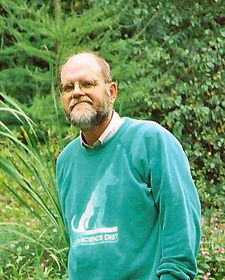 During the year planning was done for an attempt to establish a "Ken Avery Research Fund" at the University of Minnesota that would support student research in the Department of Horticultural Science. The University estimated that about 5% of a fund could be expended each year for student research. Friends President Harriet Betzold by late Summer had received a ready to sign agreement from the University but the minimum funding required was $10,000 and the board decided not to pursue it. 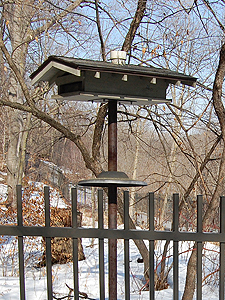 The Ken Avery Birding Terrace. 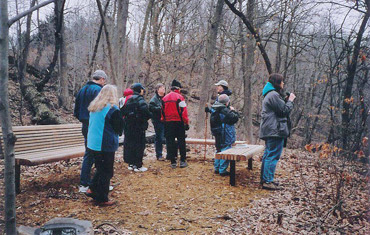 The layout of the Avery Birding Terrace. 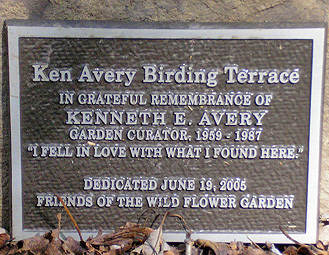 As Ken Avery had become an avid birder during his tenure at the Eloise Butler Wildflower Garden, The Friends of The Wild Flower Garden and the Park and Recreation Board decided in 2004 on the creation of a special place for bird watching and, as a honor to Ken and his dedication, named it for him. The Friends would fund the project. 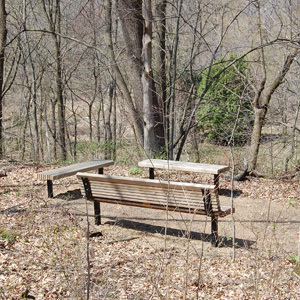 There are three wood benches made by Earl F. Anderson Inc.; a basalt column carved bird bath from Hedberg Aggregates and a dedication plaque on the birdbath made by Awards by Hammond, Inc. The surrounding area was planted 350 new shrubs and herbaceous plants. 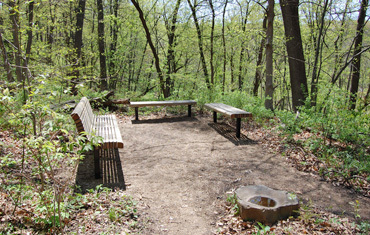 This area is near the back gate on a natural bench of land just off the trail leading to the Upland Garden. It overlooks the wetland and the Hemlock Grove. Native bushes and flowers are planted there. 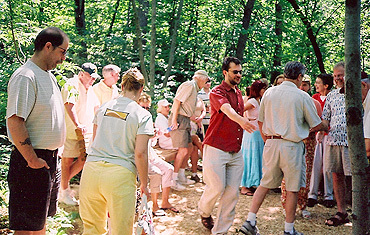 It was dedicated on Father’s Day, June 19th, 2005 at 2 p.m. A large crowd attended. 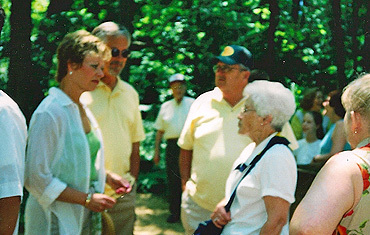 Comments were given by Friends President Steve Pundt; Muriel Avery, Ken’s widow; Cary George, who immediately followed Ken as gardener; Dan Hasty, who had known Ken as a Park Board colleague and mentor; Park Commissioner Vivian Mason; Tammy Mercer, who conducts birding programs at the Garden; and Susan Wilkins, the current Garden Curator. Below: The terrace is elevated above the wetland area of the Garden, situated half way between the Upland and Woodland Gardens. 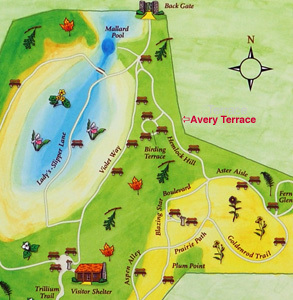 It's location is at the north end of the Woodland Garden - noted in the center of the map. 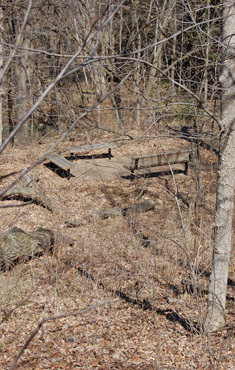 Above: The placement of the Birding Terrace on a bench of land that in elevation is half way between the lower wetland area and the Upland Garden - shown as it appears in the early spring before leafout. Above: Part of the large crowd on Dedication Day. Muriel Avery speaking on Dedication Day. Friends President Steve Pundt in background. Note: The first section of this history incorporates an article written earlier by Friends Member Constance Pepin. Her article was originally published in the Friend's newsletter, The Fringed Gentian™, Winter 2005 Vol. 53 No.1. Papers and notes in the Martha Crone Collection, Minnesota Historical Society. Annual Reports and Board Meeting Minutes and Correspondence of the Friends of the Wild Flower Garden, Inc.
©2015 Friends of the Wild Flower Garden. P. O. Box 3793, Minneapolis, MN 55403. All photos are the property of the Friends unless otherwise credited. Text and documentation by Friends member Gary Bebeau. Opinions expressed are solely his.